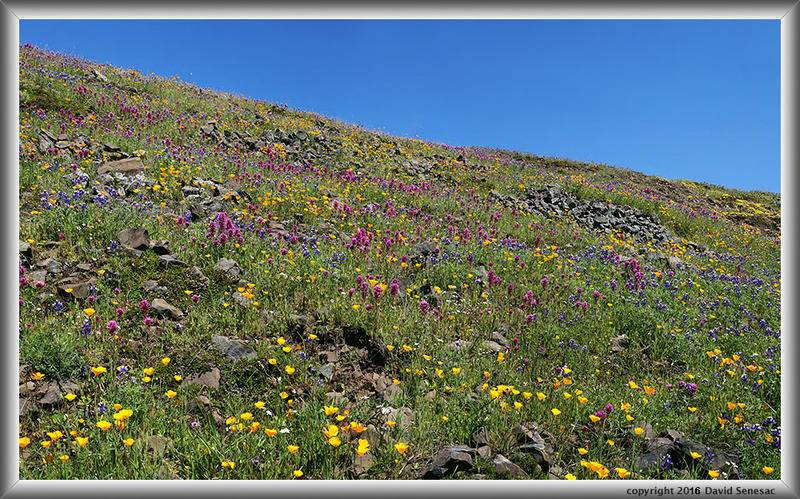 After the long Death Valley trip I would have little time to relax as it was the peak of wildflowers for many lower elevation locations throughout the state. There was only one destination on my mind as I plotted out a plan during my workweek. 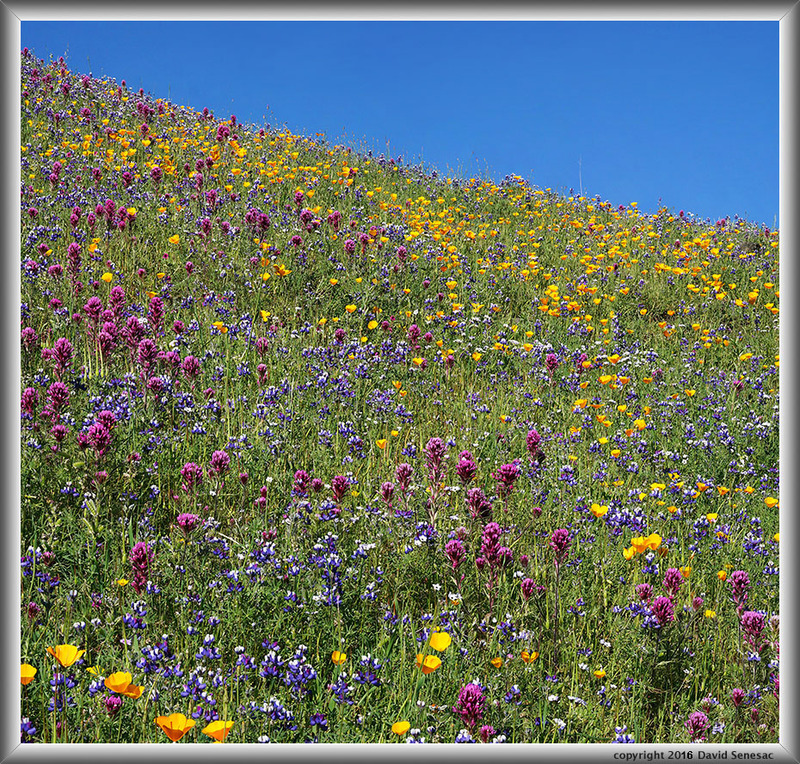 All winter I monitor rainfall at weather websites for California spring wildflower locations. The Butte and Plumas County Sierra Nevada region had been receiving well above average precipitation throughout the 2015/2016 rainy season. Paradise is a few miles due north of North Table Mountain and Strawberry Valley east at a higher elevation. The chart shows that after a dry February, that March was a huge month in that region and is also the most important month for plants on that plateau. That region also has the highest average yearly precipitation of any Sierra Nevada region though because much is below average snow elevations most falls as rain and not snow. Accordingly it is lush with marshes and jungle-like riparian areas even out in the Sacramento Valley below. 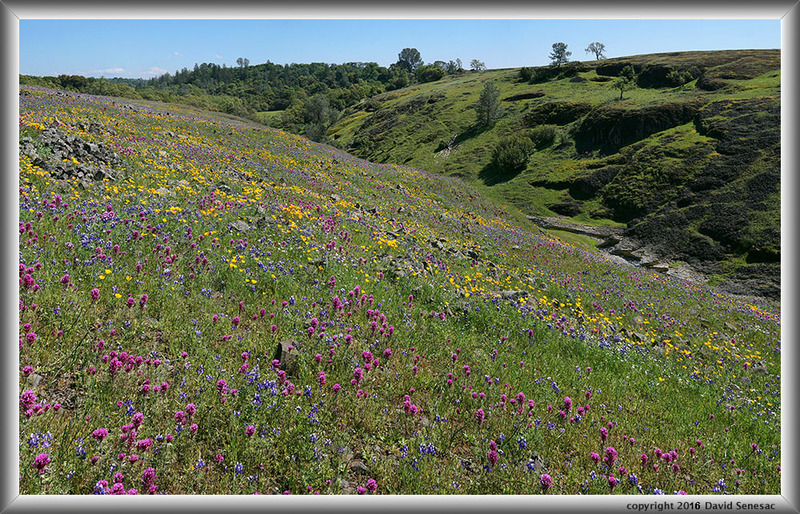 At the end of March another closer though lower elevation weather site at the Oroville Dam that averages 4.2 inches in March was showing 7.5 inches for March (178%) so the nearby North Table Mountain Ecological Reserve was indeed likely to have an excellent wildflower season. The reserve itself is atop a volcanic basalt tableland above the urban area that always receives heavier rainfall than below because it is an abrupt transition from the Sacramento Valley causing an orographic lift in storm clouds. I had visited the reserve a few times over the years and on April 6, 2013 captured some excellent 4x5 Provia images despite the droughty year in part because it did have near normal rains in March. North Table Mountain is a generally level plateau of hard black volcanic basalt rock where erosion has cut ravines into. 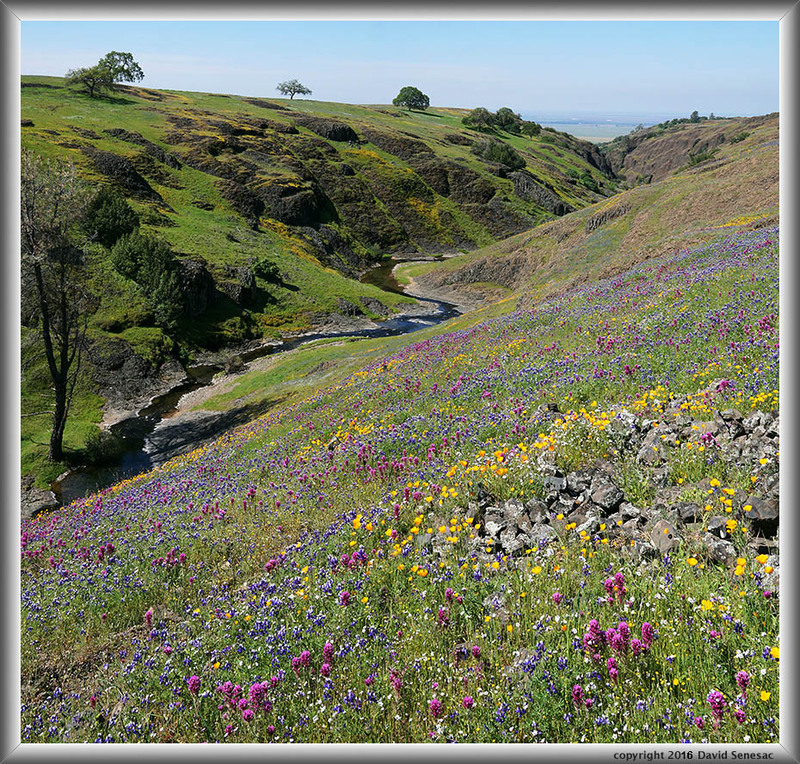 From late February through April there is a succession of wildflower species with flower landscapes changing quickly week to week. Thus timing a visit is key. The most showy species are poppies, purple owls clover, goldfields, gilia, and lupine all of which tend to peak together between the last week of March and first week of April. Many visitors come to view the several waterfalls that have small drainage basins and accordingly should be visited within a few days of storms. However one that also wishes to view wildflowers will not want to visit during or immediately after a storm because plants and especially flowers take a day or so to straighten up after being pounded by rain. Also there are numerous mushy areas in the impervious basalt landscape where surface water is slow to drain off after rains and are often difficult to avoid walking through. Additionally of concern to any photographers that wish to capture static subjects not moving about, the open exposed plateau sticks out at the edge of the Sacramento Valley so is quite subject to wind thus visiting on days when breezes are manageable is important. A day without any breezes at all would be rare during March. The Chico Hiking Organization link below has an excellent map of the reserve: Select the pdf Hike Map that I would highly recommend printing out and carrying during visits as there are few recognizable objects in some areas to orient with given the somewhat level topography. During my work week on the last week of March, an unusual storm moving up north from Baja California in the south complicated weather as this region was on the periphery of its track. I carefully monitored wind forecasts for the area that showed the weather system would exit Thursday with Friday and maybe Saturday having lightest breezes. Thus put in for a day of personal time off for Friday. 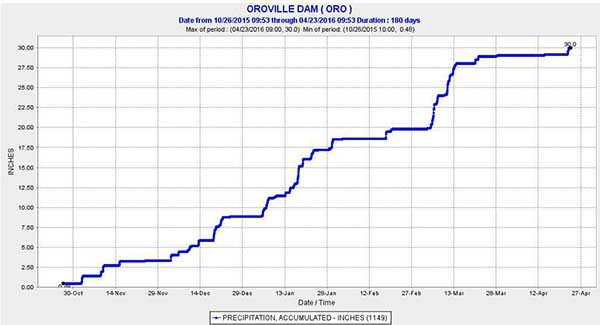 On Thursday the storm brushed Oroville dropping a piddly 0.15 inches that I was glad was minimal so would not affect plants. That afternoon left my workplace at 5:30pm Thursday March 31 with a modest 200 mile drive through the valley including Sacramento and Marysville before reaching Oroville late evening. The reserve dirt parking area is beside a single large valley oak tree that sticks up high across the barren plateau that can be used as a landmark for orientation on return. There is just one trail that routes to Hollow Fall and then down through the oak woodland of Campbell Creek canyon. However there are no trail signs. There are also many use paths one might follow including those made by cattle that were numerous in the reserve and their pies were constant objects to avoid stepping on. I do think there are maybe 4 times as many allowed to graze the reserve than are optimal for the sake of spring vegetation so would prefer the DF&G prune back current numbers. Visitation to most areas of the reserve requires cross country travel. Cross country foot travel across these landscapes can be rather tedious because there are many loose foot sized basalt rocks that tend to move about when stepped on so visitors without at least fair balance ought to stay on the one trail or the parking lot zone. If one visits popular Hollow Fall, after arriving via the trail to the top of the fall be sure NOT to take any of the steep dangerous use paths that descend directly down the slope on lookers left. Instead climb up a few feet to the left up and over a small rocky rise where the real trail traverses gradually into the woodland before a spur trail at the bottom routes to the fall base. By sunrise Friday April 1 I had driven to the ecological reserve dirt parking area on Cherokee Road, the only person there. Well unless someone was sleeping inside one of the dozen or so green port-a-potties? Although there would be dozens of vehicles in the lot and along the narrow road by late afternoon, most visitors don't arrive until late morning. Skies were sunny with a few high thin clouds, the breeze was light, and temperature was in the high 50s and forecast to rise into the 70s. After setting my cell phone Trimble Navigator GPS tracking on, off I went towards a location I won't specify herein. 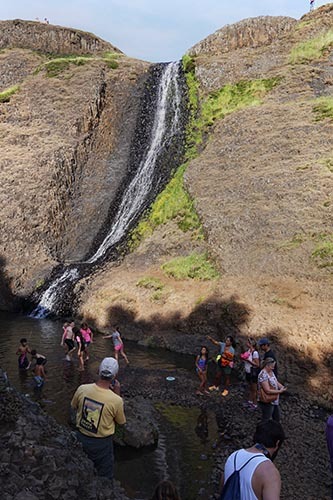 The 5 square mile area is large enough that the bulk of visitors only hike about a limited area near the parking area and on use routes towards Hollow and Phantom Falls or down the riparian oak forest of Campbell Creek canyon. Although the area I photographed easily has the best wildflowers each year, few public visitors seem to be aware of that. Not a secret area at all, but not one I choose to draw extra attention to. Later in the day there were many people including those with tripods near the popular Hollow Fall section and it is just as well most casual visitors concentrate there. In fact on this Friday I did not see any other photographers working the area I visited even without tripods. Part of the reason is those wandering through the area more than a week before or after the peak would not be especially impressed as it would not appear particularly more flowery than other sections. The peak displays are just that fleeting. 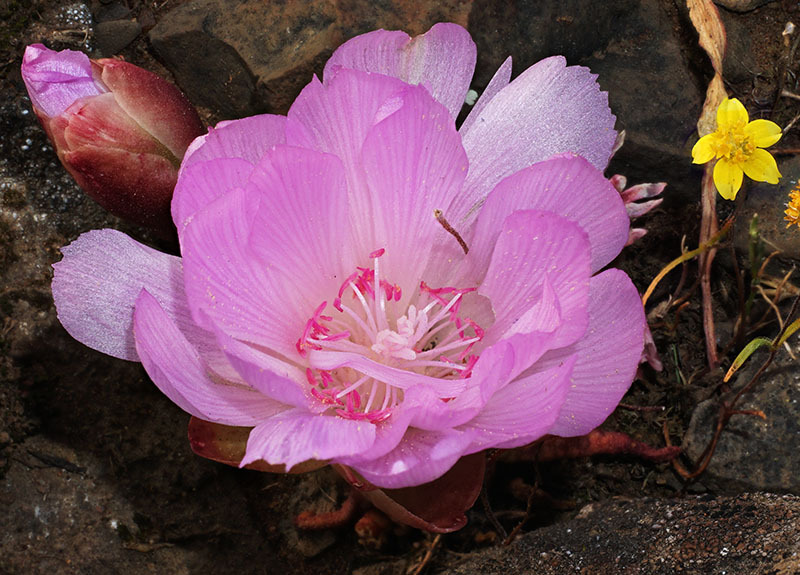 The amount of flowers in the different areas varies tremendously and species tend to grow so each season in the same locations thus becoming familiar with what and how much grows where in the reserve is also key. Along my cross country route flowers did not appear noticeably better than during my 2013 visit. 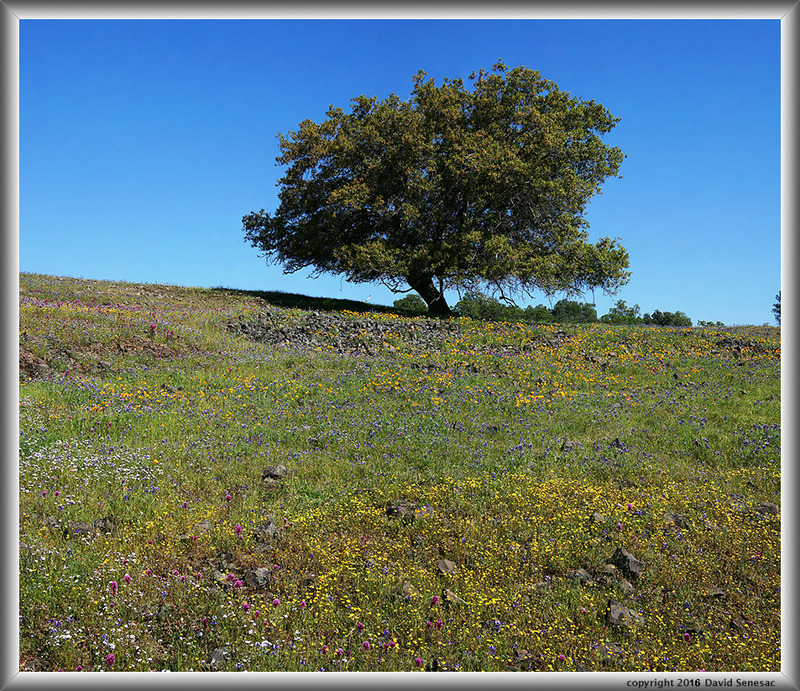 A bit later after working near foreground stream subjects was the above image shot at 11:15am, a colorful mix of wildflower species before a canyon live oak, quercus chrysolepis. 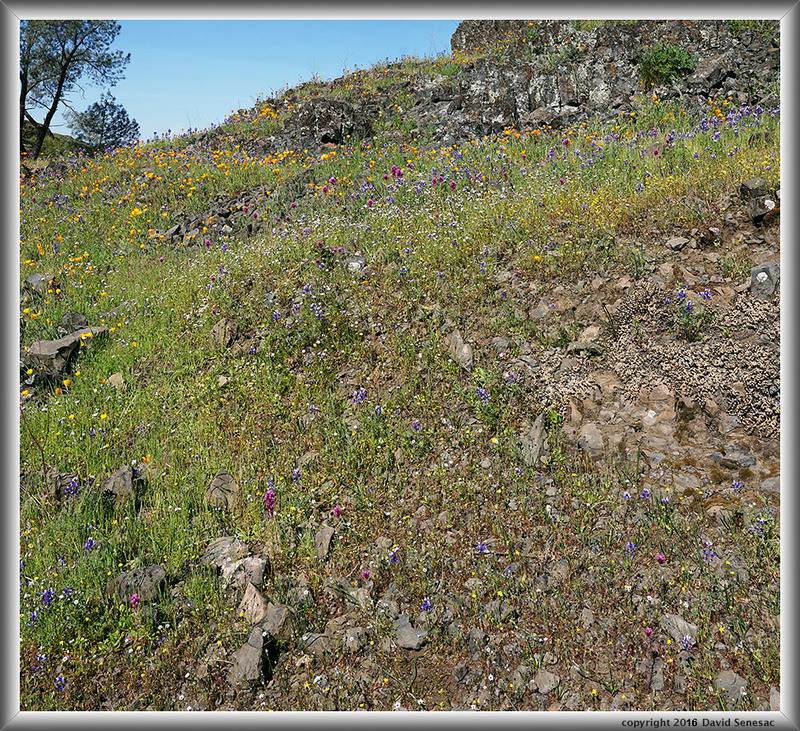 California goldfields, lasthenia californica, sky lupine, lupinus nanus, bird's-eye gilia, gilia tricolor, purple owl's clover, castelleja exserta, fryingpans, eschscholzia lobbii, foothill poppy, eschscholzia caespitosa, Douglas' silverpuff, microseris douglasii, and blue dicks, dichelostemma capitatum. There was still enough of a gentle breeze that I kept my 30mm lens on instead of the preferred 60mm that would create larger images if breezes were calmer. With 4 times as many frames required with the 60mm, the trade off waiting for breeze lulls would be far less completed subjects. After working another two subjects, at 11:45am found this landscape above with exceptional flower pattern geometry. 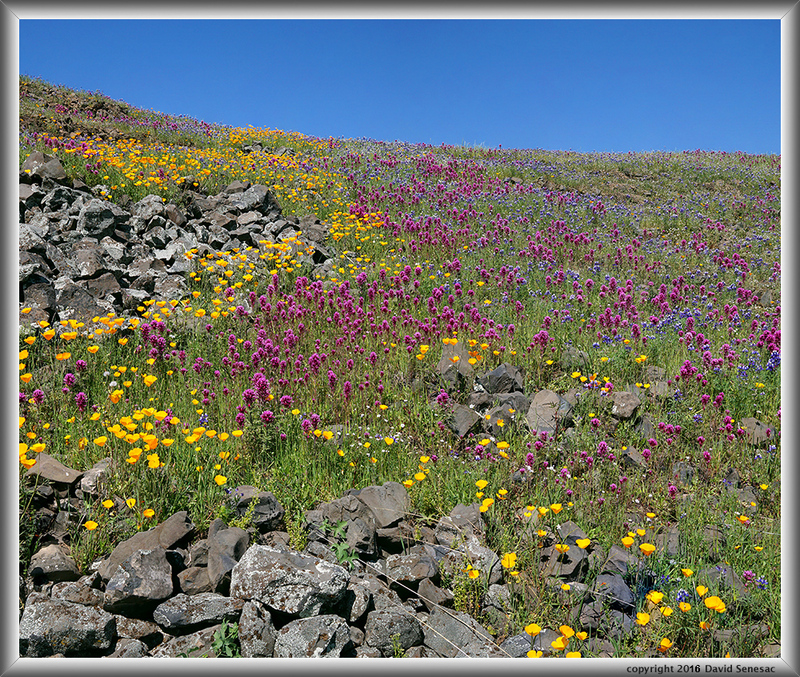 The mix of colors and patterns of wildflowers at North Table Mountain provide an outstanding opportunity for talented photographers to look for aesthetic geometries in their frames. And the stream in this zone was continually in my sights as a middle and background component for doing so. The flowers were usually somewhat sparse near the water so my attempts to frame subjects close to the stream lost impact. Much better results were up on the slopes of the ravine where I could get close to colorful flowers and use the more distant stream in the background. In any case, wildflower landscapes like these are always significantly more impressive visual experiences with our human eyes than any camera will ever hope to capture. Thus in that sense the greatest treasure to this person over the years is having experienced these places live and not the camera images that saved them as best they could. Photography is thus more a purposeful vehicle with experience increasingly bringing the participant into greater aesthetic realms than if one were simply a viewer seeking scenic visual enjoyment. In many places the rock hard basalt geology has formed cliffs and that is the primary reason for so many waterfalls in the reserve. 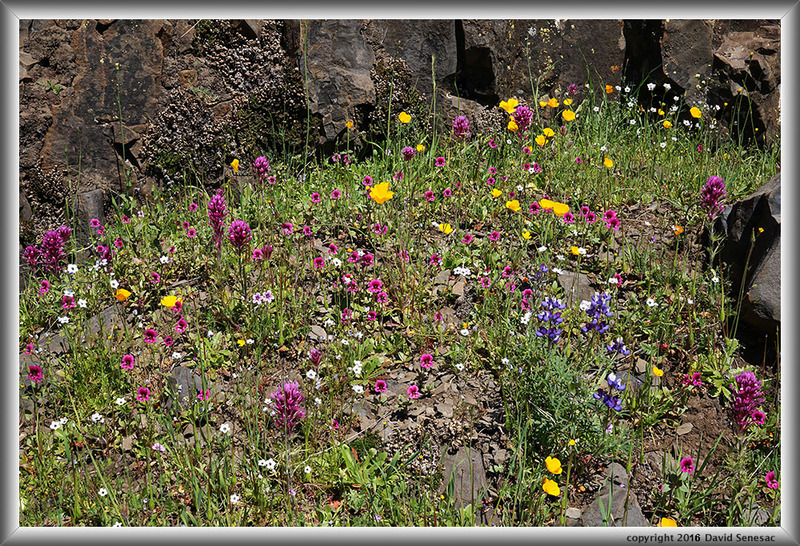 Basalt tends to form six-sided vertical columns and in places there are short cliffs in ravines that provide alcoves for intimate flower subjects like the above. In such places one will more often find species that are uncommon in the open grasslands. I spent considerable time sitting in front of this scene with my 60mm lens trying to capture a 2x2 pano but the breeze was simply a bit too uncooperative. Thus put my 30mm lens back on and was content to work through a set of 8 focus stack shots waiting for reasonable lulls to make a single frame image. 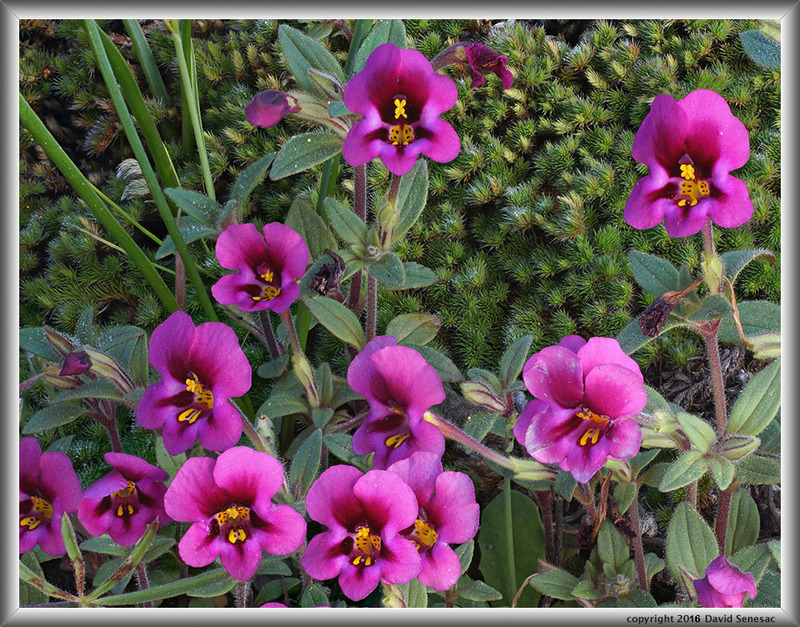 The beautiful little magenta species is Kellogg's monkeyflower, mimulus kelloggii, that tend to be found on mostly barren rock patches. Another species here I haven't mentioned wherever cattle graze is the ubiquitous alien Eurpoean red storksbill aka filaree, erodium, with their long upturned beaks. See their two side by side light pink hued flowers center left frame? After a couple oblique subjects with sky, shot another above at 1pm PDT with the sun at it highest altitude that captured another riotous mix of strong color. With flowers much like fall leaves, the saturation of subjects hour to hour is very dependent on the direction one is pointing a lens. Thus I am always first assessing where color looks strongest and then finding frames from that direction. If color looks flat on an otherwise strong subject, I will consider what time of day that might change for a later return. 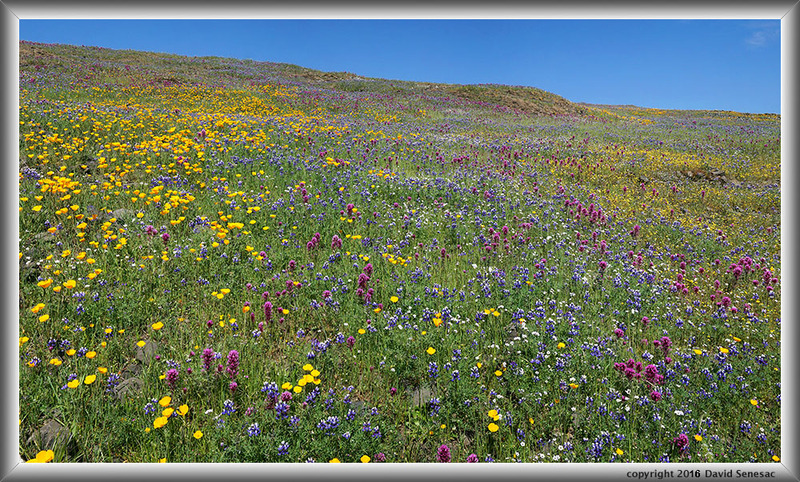 As I'm standing on these slopes this Friday am shaking my head while being aware I'm standing out looking at what are arguably the strongest wildflower landscapes in California during this 2016 El Nino year at absolute peak and there are virtually zero...nada other photographers about. A few groups of people by late morning did pass through this section on their way to waterfalls and most probably snapped some selfies and group pics with their cell phones but that was about it. It was time to take a break and eat some lunch down near the stream. Afterward I worked a few modest subjects while waiting for the sun to drop a bit more in the sky improving the light to do more serious work. At 3:50pm shot this view up the creek. The yellow foreground flowers are seep monkeyflower, mimulus guttatus. In the enlarged vertical slice view center slice one can see a couple with a dog relaxing lying on their backs on the turf enjoying their experience. And in the sky of the left slice are two circling buzzards. Quite a distance away in the reserve at Hollow Fall there were certain to be dozens of people of all types with lots of kids running about yelling and screaming having good fun. But here during a wonderful sunny spring day, still very quiet with a few isolated groups moving through after late morning through the afternoon. I saw lots of strong subjects all about but the breeze had simply became too difficult for blending sets of images. Had I been carrying the Wisner 4x5, I would have been much more active because there were lulls in the breezes but too few if one is taking multiple shots per image. By this time I'd convinced myself to give Saturday a shot instead of driving home. So no need to stick around to the end thus endured one last subject above at 4pm. Put on the 60mm for a close-up mug shot of a steep dense patch of flowers with much filaree, green beaks pointing up, and deep blue sky. At the skyline in the center slice of the enlarged vertical slice view are a group of grass pink, petrorhagia dubia. The mid to late afternoon I'd been waiting out ended up being disappointing however I was feeling good about the wonderful subjects captured before mid day and had reason to hope Saturday would be productive too. I rambled back rapidly to the parking lot arriving a bit grubby, sweaty, and weary. TN GPS showed 7.1 miles of hiking. And yeah what a zoo there but good to see all these people enjoying themselves in their own personal ways out in this wonderful place. Reflected on the vastly more people even in this valley region that have probably never visited their nearby treasure. Drove into Oroville late afternoon and got an inexpensive motel for the night that was clean and pleasant giving me some relaxing time to plan Saturday. Because I'd already explored much of the area of most interest, I didn't need to arrive there early but rather when the poppies began to open that would be about 10am. Arriving at the reserve about 7am on this Saturday April 2, there were already a few other vehicles in the parking lot. Not surprising as it was now the weekend Saturday. Any locals familiar with when these landscapes usually bloom would be coming out for this first April weekend. The forecast Thursday showed Friday was supposed to have lightest breezes but at the motel Friday forecasts were now showing Saturday about the same. The technical weather map showed much of Northern California was in a narrow slot of calm fair weather between troughs both west and east. To me that meant breezes would likely be light though erratic all day changing in direction and that usually also meant there would be some periods of calm. Took an indirect exploratory route out to the zone I'd worked Friday dawdling, stopping a few times for close-up subjects, arriving about 9:30am. With some time to fill worked the above group of Kellogg's monkeyflower, mimulus kelloggii, flowers against some still green moss using my 12mm extension tube atop the 60mm lens plus my collapsible 32 inch diameter circular Impact diffusion disk. With warming temperatures, poppies opened up a half hour earlier than Friday so was time to work landscapes. 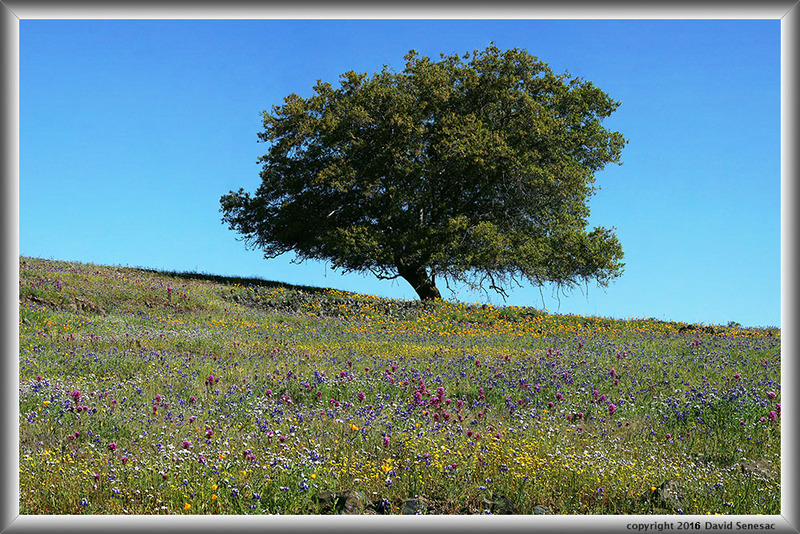 At 10:30am went over to the canyon live oak subject atop the plateau I'd worked early Friday since it had such a superb complement of wildflowers and tried a couple new perspectives. Using my 60mm moved further back behind where the slope dropped off to a more level perspective of the sloping plain of flowers that produced a superior result with the mix of color more compressed and grouped into colorful bands. After a couple subjects later at 11:30am worked this perspective down canyon out towards the Sacramento Valley. In 2013 with cold clear air I could see snowy peaks in the Coast Range but not this day as the lower atmosphere was hazy white. 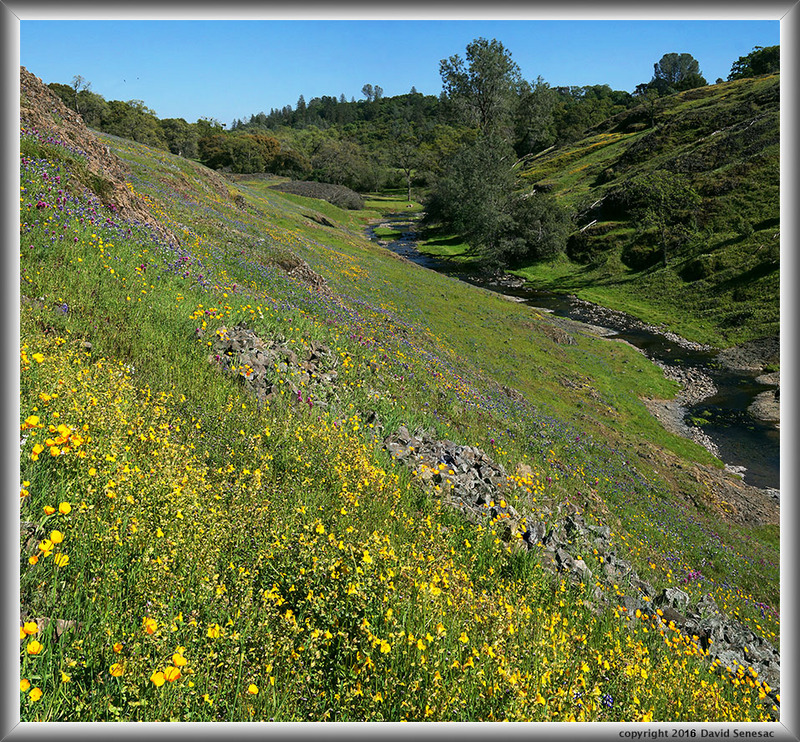 Note how the dense areas of wildflowers are just on this side of creek canyon. But when I visited 2 weeks later the opposite was the situation while most of these flowers had already gone to seed and disappeared. However species on the opposite slope were different, not as showy, nor as dense. The yellow hued flowers on the opposite slope are seep monkeyflowers. And by the end of May all of this will look very drab brown and dry. The stream is ephemeral too disappearing by summer except for some shaded pools that thankfully provide water for animals. Though there are no fish in the stream one will see numbers of California newts and hear Pacific tree frogs. Thus a brief season of abundance, color, and glory. At noon I was set up on the image at page top but an increasing breeze frustrated my attempts waiting for lulls. Took a break eating lunch and noted the breeze increasing. The subject was exceptional and the mid day light was less than optimal so decided to explore elsewhere for a couple hours and return mid afternoon. So I ventured out of the canyon onto the tableland plains that were wonderfully green with swaths of different species concentrating in their own favored zones. Such a wonderful wonderful place is this plateau! 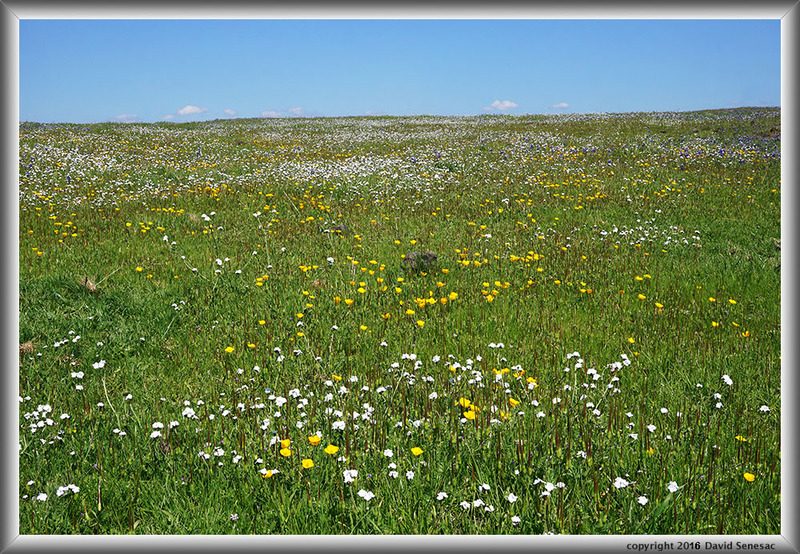 The above image contains just two species, popcorn flower, plagiobothrys nothofolvus, and fryingpan poppies, eschscholzia lobbii, among the lush green grasses. As abundant as the grasses are myriad filaree with their upturned beak but only a few were yet showing their little pink flowers. With a conventional fixed focal plane camera one would be limited by depth of field to pointing a camera down towards the ground at larger angles. Anything more acute would be sure to have parts of the scene out of focus even if stopped down to minimum aperture openings. A view camera using front standard tilt would be able to capture a detailed image. But today with focus stacking these images are also possible with digital cameras and for the above with my camera at a more aesthetic perspective near the bee flying level of these low plants, close to the ground, took 10 shots at F11 that after post process blending in Photoshop is sharp frame bottom to top. 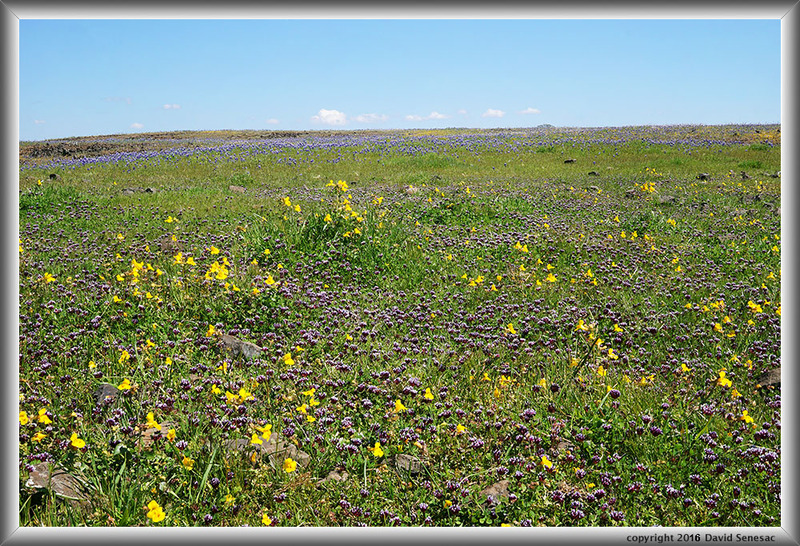 With an identical close to ground strategy in this mushy seep area worked the above subject with seep monkeyflower, mimulus guttatus, white-tipped clover, trifolium variegatum, and atop the rise, sky lupine, lupinus nanus. It is spots like this where one will be certain to get boots wet if visiting too soon after rains fall. And again on a hard basalt substrate dwarf stonecrop, parvisedum pumilum, California goldfields, lasthenia californica, and on the rise sky lupine with oaks in the background distance. And note fresh goldfields have a wonderful fragrance, another reason to get low haha. 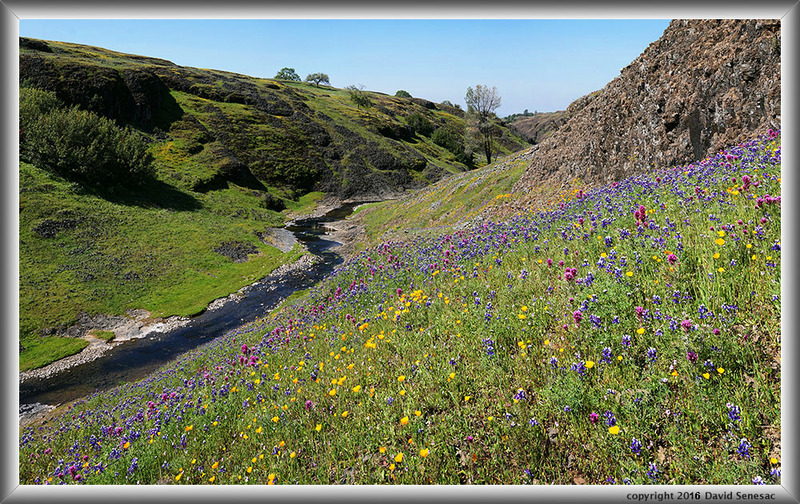 I returned to the stream canyon at 1:50pm where I worked the above fine image up canyon across a long swath of flowers towards the oak woodland in the background. 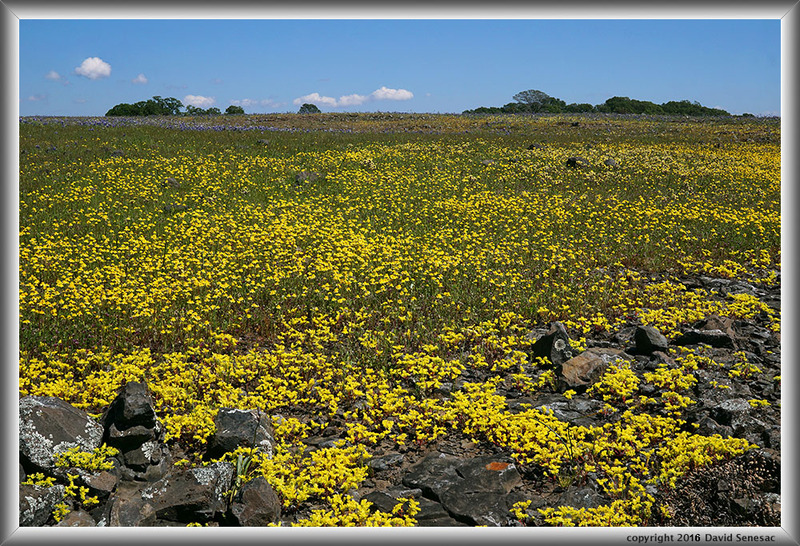 Here one can see these flower fields cover impressive areas so not just small patches as is more common in other areas of the reserve. It was then 2:15pm and indeed the breeze had waned some so I returned to the image at page top. Although I wanted to use my 60mm on the landscape for a 6 column 2 row panoramic, I thought it wise given the breeze to first just use my 30mm that only required a 3 column single row 3 frame capture. It takes four 60mm lens frames to cover the same area as the 30mm because it is a square factor. 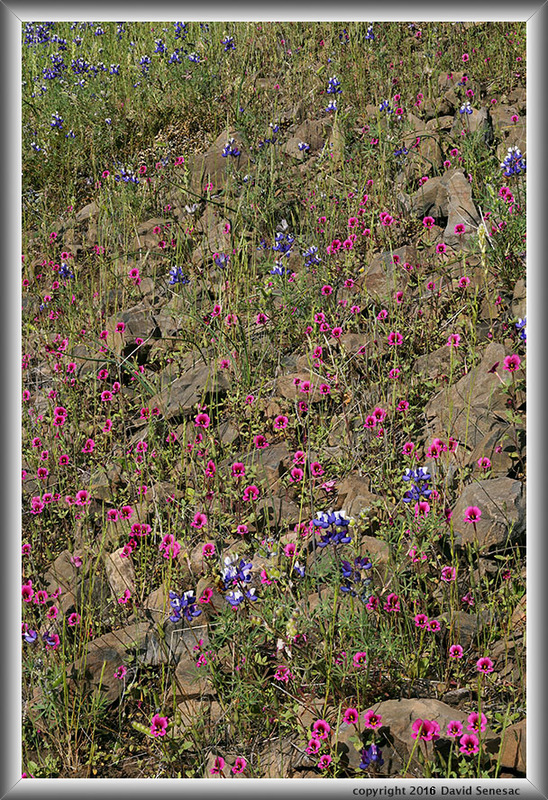 And indeed captured the wonderful image at page top, PH07883-07910-3x1v North Table Mountain riot of wildflowers, without having to wait long. Then put on the 60mm lens and waited 20 minutes but now the breeze only became more difficult and since the subject was right at the brink of the canyon, a breezy location, abandoned that effort. Another subject that would have been ideally captured with my 4x5 view camera and required just a single momentary lull to do so. There was an intense dense slope of purple owl's clover I also hoped to capture that was somewhat more breeze protected down on the canyon wall. And though I also had hoped to use my 60mm on that to make a large image, would have to be content with a small one as I waited 16 minutes to get 19 shots in that made up the above image. At lower center frame in the foreground rocks are some manroot leaves. I wanted to visit Hollow Falls before leaving so went out of my way on the return hike. There were lots of people in that area with many kids playing in the water along the creek both below the falls and above sliding down the slick rocks into a pool. At the top of the falls was a dense patch of Kellogg's monkeyflower with sky lupine so took the image above while the sky was conveniently overcast with high thin clouds providing diffuse light. Reaching the parking area, I noticed bitterroot plants in the bedrock and spent some time making a close-up of one bitterroot flower plus one goldfield flower shown below this page top my last subject of this fine day.